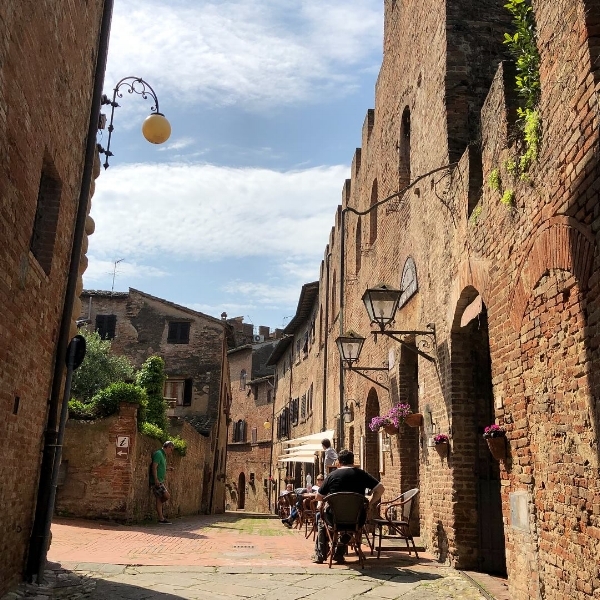 This is Certaldo, a small 900 year old village somewhere between Florence and Siena where much of what I am sharing with you in this post was born. We spent 4 nights and 5 transforming days here. I took this photo from a dirt road that winds up to it. By now you probably have heard that my 5-week Sabbatical did not return me to work re-energized and ready to go as I expected. What it did do was change the pace at which I work with others (read how here), and it changed the connection I have with my wife (read more here). The final benefit however was in an area that I did expect to see change in, just not in this way. Benefit #3-My prayer life has become both thicker and thinner. As a Sherpa Connector, I know prayer is much like the strong rope we attach ourselves to so we can stay secured to the rock we are climbing on. It also helps secure our connection to the others who we are leading on the climb as will as provide the strength and breakthroughs we need to reach the summit together. This is one of the small streets in Certaldo that I got intentionally lost on, getting lost also in prayer during the early mornings of my stay here. An artist, choir or worship team from that part of the world singing chant, or a worship song (everything from Taize to Hillsong appears in this section). The music is a meditation to set up the scripture of the day. Music plays in the background while questions are asked that draw you deeper into the truths or narrative of that scripture. The scripture is read again, with an invitation to look for something more specific now. Invitation to talk very honestly with God about yourself, Him or others. Music continues in the background. It always closes with the same blessing from the Book of Common Prayer. I share all this detail mainly to explain something I think of as "thick prayer": Prayer where you are delving deep into your own heart and into God's for an extended period of time. Certainly there are many ways to do that. This is just one of my favorites. After walking around and engaging in this kind of "thick" prayer, I found my day off to a good start. But something new happened. The conversation with God didn't end. It was as if the "Amen" wasn't a period at the end of a sentence, but just a comma. I began to hold Michelle's hand and pray for things that came up in conversation between us, or do a Bible reading plan in the middle of the day while we were eating and enjoying the view. Sometimes as I saw something that moved me, I would share with God my awe or thanks. Other times, I would write down thoughts in my journal, a thought that I wasn't sure what to do with now, but I sensed that God had plans for later when I got back home. I think of these ongoing short encounters with God as "thin prayer": Brief, not too much content, but just as real and connecting. I think it was the fact that I had no schedule during my Sabbatical that helped to create this phenomenon. But here was the surprise: it has continued that way since I came back home! I could not be more grateful that my prayer life has gotten both thicker (deep) and thinner (ongoing) as I move through my post Sabbatical world. It has produced some new practices in my assimilation ministry, galvanized some old ones, and given me new passion for others that Gene (our Lead Pastor) leads us in. We were given the largest donation Eastside has ever received: a 4.5 million dollar church property in Bellflower that enabled us to launch our 4th campus. The number of guests who gave us their contact info at Guest Central increased by 90% year over year and Next Steps grew by 26% as a result. We became the 2nd fastest growing church in the U.S.
Like many of you, I pray in the car on the way to church that God will defeat the forces that are opposing guests as they attempt to make it to church and to Next Steps. I also pray that the Hosts and Table Hosts at every campus will be empowered by God to help guests experience their connection to the Body of Christ. This regular practice of "thin prayer" not only makes a difference in things unseen, but it makes a difference inside me as I remember whose battle this is and what my role is (and isn't). We do a lot of phone follow up when guests make decisions to follow Jesus or are baptized. When a need is shared in one of these phone conversations, I have learned to ask if I can prayer for them right now. They are always surprised and grateful to have me pray for them over the phone. Many of them have never heard a person pray for them before and it has an impact on guests in multiple ways. I try to practice this in person as well when a guest shares a prayer request with me. They are consistently so appreciative that I paused to let them hear me pray for them or their loved one. One way of expressing a thin but powerful prayer is by circling up with the Table Hosts and Assistants just prior to "game time" in Next Steps. I do this with any of them that are present before the guests arrive, spontaneously. When we do this, we can sense our dependence shift internally from ourselves to God. We also observe breakthroughs together that we credit to God and our asking Him for them specifically. At the end of every session, we have Table Hosts pray that the assignments of the week at Next Steps will make a powerful difference in their growth as a Christ follower that week. Though they do not have time to ask for prayer requests, they usually include in this prayer anything that an individual may have shared in discussion that could use prayer support. Sometimes, they even email that guest during the week to see how that issue is progressing. POC stands for Pastor On Call. We always have at least one available during and after services. The cool thing is that they are not just ordained staff, but Next Steppers who have graduated who have the gift of pastoring. I am so proud of these people when they serve in this role. We are in the habit of referring people to POCs from Guest Central and Next Steps when we sense someone needs a level of conversation and "thicker" prayer that can best be experienced in a pastoral moment in a room we have dedicated for this purpose. David Sotelo is one of our interns and also a young adult. He is not a ministry major or necessarily pursuing vocational ministry. Recently he received a card that a guest sent to our office addressed to "Pastor David", thanking him for taking the time to listen and pray for them. Whether it takes place in our office on weekdays or in the church at weekend services, there is nothing quite like this kind of prayer for helping guests feel connected to God and our church. Before Christmas and Easter services, Gene will have the entire staff meet him in the auditorium to hear him share specific prayer targets surrounding these high-outreach weekends. He then sends us for 20 to 30 minutes to anywhere a guest might appear that weekend: Every seat in the auditorium, Guest Central, the parking lot, restrooms, Kidside, and more. All are covered with "thick prayer" from the perspective of guests who we want to see connect with God and others at our church in these services. It gives us as staff the conviction that our property is now set apart for a holy purpose and we are ready for it, come what may. 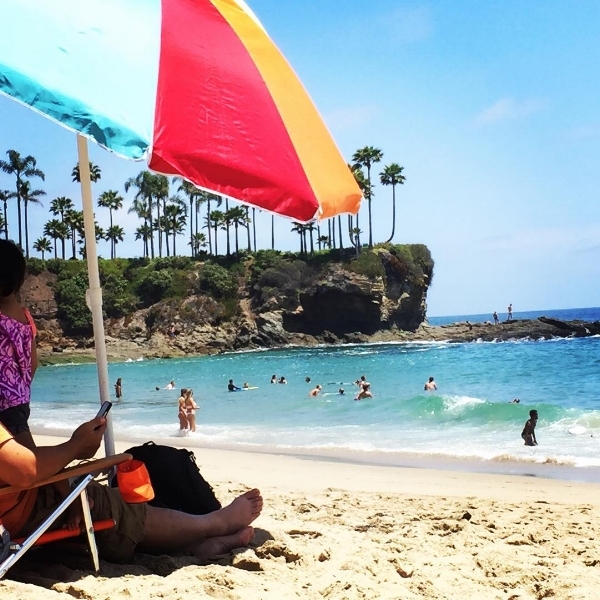 This is a cove near Laguna Beach where I often go to pray when I am off. I took this photo there during the last week of my Sabbatical. My conversations with God are getting thicker and thinner here since my Sabbatical. For me, this photo represents how vibrant my connection with God has become, now that I am back home. This is one of my favorites moments of thin prayer and a real privilege. Whenever someone has completed all 4 sessions of Next Steps, they are given a Certificate of Completion (Diploma) for graduating from the training. I am always amazed at how much they value these certificates. On all campuses, they are printed out with guest's names on them so that they are ready for the guest's final session. They have Gene's signature printed on them as well and a wet signature from either myself at the Anaheim campus or a Campus Pastor at our other Campuses. We sign each one individually so that we can pray for each person being added to our church by name as they are being added. This not only gives us name recognition for guests joining our church, but it also gives us the ability to say to each Next Step Grad, "I have prayed for you by name". This just feels right. This is a time to thicken the prayer life of everyone at our church in a way that those new to our church can easily connect with. Inspired by Church of the Highlands in Birmingham AL, we do this one to two times a year to rally people around who they are as followers of Jesus in our community in this generation. This year, it will be attached to Gene's series on the book of Acts entitled "The Deep". The online prayer guide breaks Acts into 21 readings, gives a key thought for prayer each day fueled by a daily video prayer request from an Eastside staff person released through social media. To thicken the prayer even more, we have Wednesday evening Nights of Worship during the 21 Days to help the church members new and old experience prayer in community. Rocket fuel for the climb. Since returning from my Sabbatical, my prayer life has become an ongoing tapestry of thicker and thinner conversations with God throughout my day. It has also been permeating the lives of our guests in ways they don't even realize. My challenge to you as a Sherpa is to not take any guests on the climb without taking prayer along with you as a key piece of equipment for reaching the summit. Coming soon: Have you seen Jurassic World: Fallen Kingdom yet? We had quite the experience during the filming of this motion picture that directly ties to the assimilation ministry of a church I was doing a Base Camp with at the time. It was very surprising and I think it might catch you off guard as well so stay tuned. Would you describe your prayer life and ongoing connection to God as thick, thin, or barely existing? What does that look like in an average day at home and at work? Name at least one reason for that. What is the role of prayer most like in your ministry of connecting guests right now? Are there any of the 8 ways of thick and thin prayer mentioned above that inspires an idea you could implement this month as you assimilate guests? Should you start a new service or a new site? Three unexpected benefits from my 5-week Sabbatical, # 2.